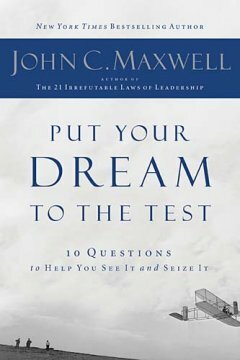 No doubt, John C. Maxwell's Put Your Dream to the Test is a greatly inspiring book. In this book, John helps people answer ten powerful questions to reveal a future where their dream is fulfilled. A dream is only worth pursuing further if it is truly our own dream. We don't want to live out somebody else' dream - be it our parents', teachers, etc. Do I clearly see my dream? If you can't see it, you can't seize it. Am I depending on factors within my control to achieve my dream? I, not only need to know what are my strengths, but I also need to know what are my weaknesses. Does my dream compel me to follow it? Do I have what it takes to drive me on despite the challenges? Do I have a strategy to reach my dream? Am I moving closer to my dream? Am I willing to be persistent despite all odds? Does working toward my dream bring satisfaction? Essentially the flip-side to the Cost and Tenacity Questions, this question ask if it is worth pursuing the dream that may cost us considerably -- does this dream bring me fulfillment that I am willing to pay the price. Does my dream benefit other? There are numerous uplifting quotes, anecdotes, etc scattered throughout the book. This is definitely another of John Maxwell's books that is worth re-reading and re-reading again.